The decade-long decline in the homeownership rate in the United States has generated substantial discussion over its future path. 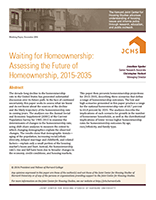 In the face of continued uncertainty, this working paper seeks to assess what we know and do not know about the sources of the decline and the likely trajectory of the homeownership rate in coming years. The analyses use the Annual Social and Economic Supplement (ASEC) of the Current Population Survey for 1985-2015 to examine the determinants of changes in the homeownership rate, using shift-share analyses to measure the extent to which changing demographics explain the observed changes. The results show that demographic trends—aging of the population, increasing racial/ethnic diversity, delayed marriage and childbirth, and related factors—explain only a small portion of the housing market's boom and bust. Instead, the homeownership rate's rise and fall have been due to broader changes in the economy, credit conditions, and housing markets. This paper then presents homeownership projections for 2015-2035, describing three scenarios that define a range of homeownership outcomes. The low and high scenarios presented in this paper produce a range for the national homeownership rate of 60.7 percent to 64.8 percent by 2035. The analyses describe the implications of each scenario for growth in the number of homeowner households, as well as the distributional implications of lower versus higher homeownership rates for homeownership outcomes by age, race/ethnicity, and family type.